You can spend a lifetime studying the martial arts. And yet your sensei preaches that you should only use your skills as a last resort. Violence always begets violence, we're told. Carl Jung wrote, "Every victory contains the germ of future defeat", meaning that there is always someone who can take you on, no matter how much success you've had in your ability to handle yourself in the past. Regardless of how many years you've spent in the dojo, the possibility always exists that you'll encounter something you've never seen before in your training. So how do you avoid this ugly scene before it happens? Believe it or not, this starts by how you present yourself to the world. If you appear arrogant and look for trouble, there's no doubt you'll find it. However, if you perceive yourself as a victim or a loser, you'll end up for sure as someone's target practice. The key is to combine equal amounts of humility and confidence that you have developed from your training into your daily life. Humility and confidence are the yin and yang of the martial artist's persona. The great swordsman/strategist Miyamoto Musashi once said, "The warrior must make his warrior's walk his everyday walk". This is a quality of living that can't be faked, and its essence can be felt even by strangers. I've read accounts of how martial artists should carry themselves in public; exuding grace, good posture and so on, but I believe that there's an ineffability to the martial artist that goes beyond the physical. The main difference between the martial arts and competitive martial sport is one of focus. A muay thai kickboxer has an innate sense of what it is to be a fighter; fighting comes naturally to this individual. In my experience, the majority of people who gravitate towards traditional martial arts do so out of a desire to simply protect themselves, not necessarily to engage in contests. The martial arts adept has hard earned fighting skills and can fight, but would rather live to see another day if at all possible. If it's true that fighting is really the final refuge for the martial artist, then measures should be considered to offset this possibility ahead of time. Awareness is imperative in the martial arts. The eyes must see all ways, the ears must listen in all directions are Okinawan karate precepts, but we have more at our disposal than ordinary sensory perception. The human nervous system is hardwired to detect danger, even if there is no apparent threat. Having a "gut feeling" is not really a metaphor, but the response of neurons in the abdominal region that interprets something as wrong. Intuition (kan) is real and operates best when we're in a state of bare-minded attention. Simply put, be aware of your surroundings. If you do find yourself in a pre-violent altercation, try to remain calm. Convey the idea that while your intentions are peaceful you're still able to hold your ground. Do not assume any kind of a fighting posture or brandish your fists as this will signal the prelude to a full blown assault. 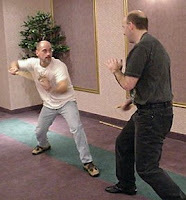 As much as ethics and philosophy are a part of the martial ways (budo), at its core they are first and foremost concerned with actual combat (bujutsu). We train for the worst case scenario, but always hope for the best. Remember your training. Trust your instincts. Do not assume any kind of a fighting posture or brandish your fists as this will signal the prelude to a full blown assault. I believe this is why we always start kata in musubi dachi at a position of attention so we are always ready and attentive to all situations and can move into a defensive posture with one simple move. Balance is such a precarious concept. One day you have it, the next, it's gone away. "I've read accounts of how martial artists should carry themselves in public; exuding grace, good posture and so on, but I believe that there's an ineffability to the martial artist that goes beyond the physical." I think I know where you've read this. . . Living the Martial Way by chance? I just finished reading it. It seems that these things are fairly attainable, but when the unexpected happens (and considering recent "events", it's really challenging to stay above it all and in control. But the whole package as you describe it is definitely a goal worth working towards. I didn't see that one. Actually we just rented Night At The Museum. I've never been a big Ben Stiller fan, but I liked this one. The kids loved it. The angled toes-out stance that starts in Okinawan karate kata I'm told is different in the Japanese styles - they start with their feet/toes pointing straight ahead. The advantage to the former of course is that it allows the practitioner more mobility. You know, it does feel like that sometimes. As you say, perseverance. I think I know where you've read this. . . Living the Martial Way by chance? Right you are. Forrest Morgan, the author, discusses at length posture and grace. The second half of that statement are my thoughts, although Morgan expresses them as well. I agree that usually the most challenging things tend to be the events you least expect. Live and learn. From what I've read of this posting, you exhort the reader to develop an internal stability wherein surprises can be overcome through following the wisdom of our natural reactions to danger. I've noticed that all of karate training is geared towards that end, but at first it appears that the movements are foreign to us. Your post reminds me of past discussions about internal martial arts (aikido, and so on) and external martial arts (karate and the like). This is an excellent illustration of how the two concepts, internal calmness and physical preparedness, serve in combination to prevent conflicts from occurring. Another method used to help an individual be aware of his surroundings is the Cooper Color Code. yellow - the individual is 'switched on' paying attention to his surroundings and watching out for porential threats. this is the state we should always be in. red - threat avoidance. the indivual has already chosen his response in orange. if there is a threat then the indivdual must act. if no threat, then drop back to orange and yellow, NEVER go to white. a lot of self defense comes down to common sense. i.e. if you see 2 blokes 'waiting' down a dark alleyway, then find a different route. unfortunately a lot of peole choose to ignore common sense. "it'll be fine, whats the worst that could happen?" I like to think that surprises (I mean the unpleasant kind) are tests. Whether you call it karma, fate or divine intervention matters little. What does matter is that our training prepares us for these sneaky mishaps. You mention wisdom, which is a quality that transcends technique. Excellent read, the Forrest Morgan tome. Yes, one of my favorite sources for my writing. Morgan wrote some other works, one on pre-war Japan and something else he co-authored on global terrorism. The sign of a mature martial artist is an absence of that ego which leads us to fight. Somebody once told me that the more confident you are in your ability, the less you want to fight. Makes sense to me. ...internal calmness and physical preparedness, serve in combination to prevent conflicts from occurring. Well, that was certainly your founder's credo. I always have to laugh when I remember some of those accounts of the O'Sensei's disciples trying to sneak up on their master in an affectionate, albeit totally vain attempt to catch him off-guard. Sometimes this was attempted even when he was asleep! Welcome to my site. I've never heard of the Cooper color code and I'm guessing that neither have most of my readers. Very interesting.